Algae - single celled organisms that account for productivity in certain ecological systems because they can photosynthesize water, carbon dioxide and light from the sun. They form the base of many aquatic and marine food chains. i.e. diatoms, dynoflagellates, psilotim. Bathymetric - denotes the contours of submerged land or submarine patterns of sand, rock, trenches, reefs, shoals or banks under and along any shoreline. Organisms living on these bottoms are called benthic communities, such as oyster reefs, corals or worm and clam beds. Bay - a relatively shallow extension of an ocean into o land lying adjacent to a continental shelf. A seascape and landscape feature created by the invasion of water. Beach - a deposition of sand along a shore line, often the quartz (silica), coral (calcium carbonate) or volcanic (basalt) material of small grain size beside the sea, or other water body such as a river or lake. Barrier Island - areas along usually sinking coastlines with very high wave energy that piles up sand or pebbles along the shore in such a way that an island forms a dam between any dry land of a continent or larger island and its adjacent or surrounding ocean. Biocenosis - A group of organisms in a self-sufficient community which occupy a small niche or biotope and coexist under external environmental conditions necessary for their survival. Coastal - from the Latin word "costa" meaning an edge. In this case a border land where any sea, ocean or some other large body of water meets exposed rocks, sand, mud, river or other topographical features along a very extensive shore. Detritus - technical term for decayed or decaying vegetation or, plant and fungal material derived from land or sea creatures that is carried by currents generated by tides or falling water or blown across distances by prevailing winds. Ecosystem - ecological system: habitat and biocoenose together– representing the combination of abiotic and biotic conditions of existence. Edge effect - The idea in ecology that a transition area between two different ecological associations, such as a forest and a grassland, is often more productive because of a greater number of species from each of the adjacent areas utilize this boundary between those areas to acquire sustenance. The measure of the functional proficiency of an association of plants, bacteria, fungi, and animals for distributing energy, water, and nutrients to all available members of the biotic community. How well the quality, quantity, timing and distribution of essential nutrients are supplied to producers, consumers, and decomposers in the interrelated geographical area. 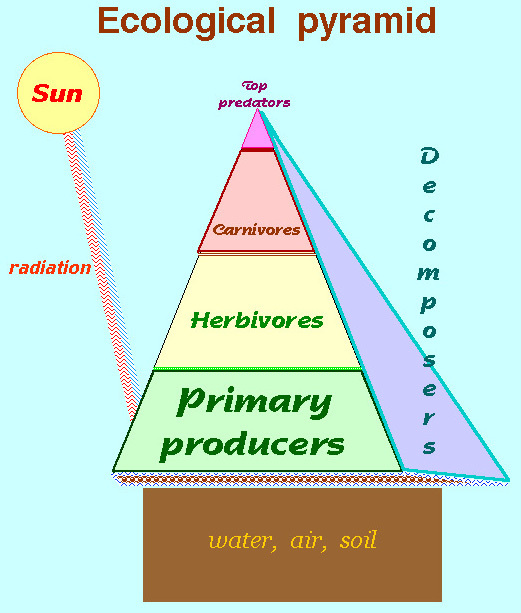 Sunlight is converted into food by plants and bacteria that must be distributed throughout the "trophic" levels of any system in order for top level predators to thrive in any viable number; hence the existence of top level predators is often used as an indicator of an ecosystem's integrity. Estuary - a coastal body of water where a river meets the ocean and thus a brackish mixing area of fresh water drainage with higher salinity marine water. Because of the tides that move up and down the river bed there is a salt wedge that forms beneath the overlay of fresh water. Where the two bodies of water meet there exists a null-zone where nutrients are suspended and recycled for use within the estuary for uptake by plankton, plants, and algae. Filter feeder - an organism, generally aquatic, marine, or estuarine, that exists by filtering out the medium in which it lives and extracting detritus which is rich in nutrients, vitamins and minerals for nutrition. 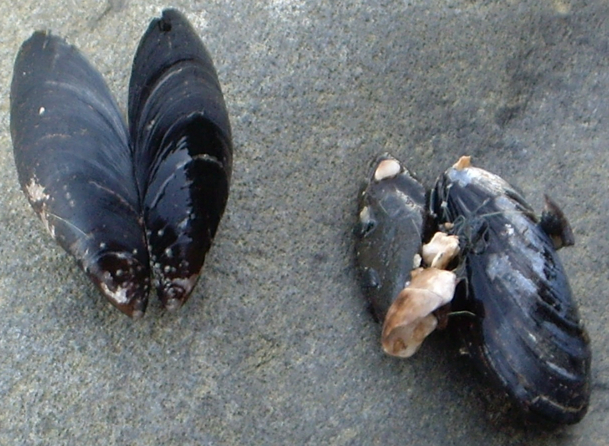 A major contributor to the food chain in submerged areas, such as oyster beds, mussels on rocky shores, or clams and cockles along mud flats, or scallops on the bay, or sea bed. Food Chain - another popular term referring to the food web or nutritional pyramid based on plants and bacteria that reflects specific relationships based on an organism's diet and indicative of the productive capacity of "producers" in an ecosystem. 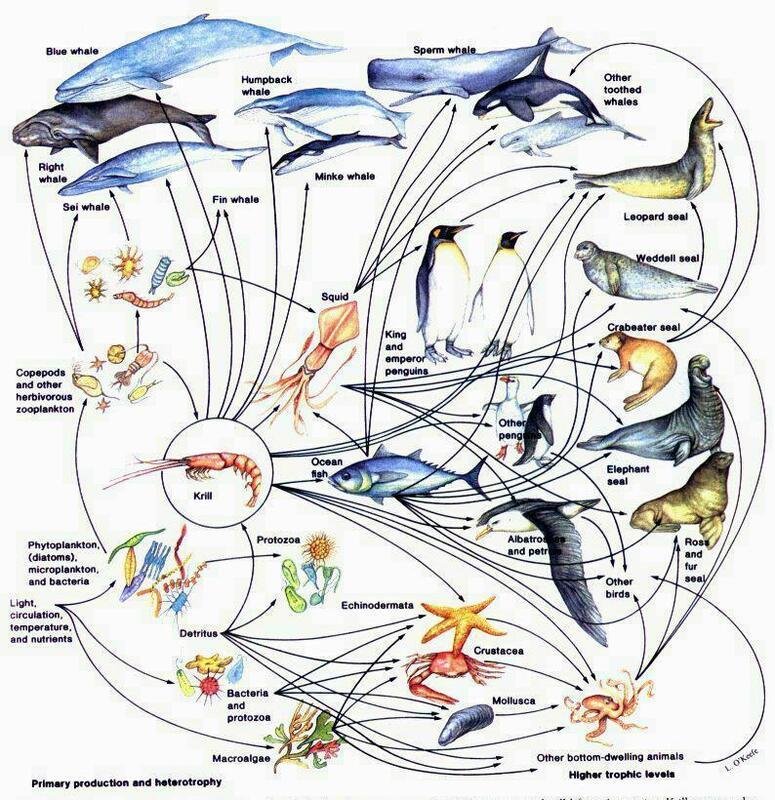 Typical marine food web revealing the crucial role of shrimp for a variety of species. Homogecene - the name given to the current geological era, after the pleistocene, because the time we live in is characterized by a worldwide spread of species that are more like one another than the more diverse species collected from the geological past. Lagoon - usually a coastal body of water that has a higher salt concentration than The adjacent ocean or rivers. Littoral - refers to The shoreline, derived from the Latin word for the shore, bank, or edge of a water body. 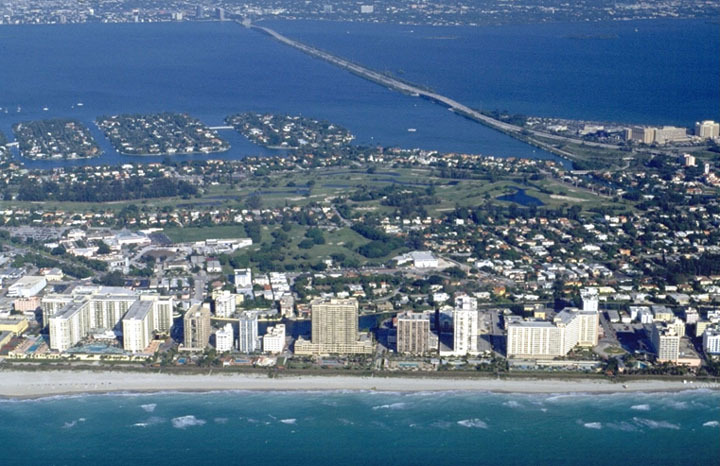 Miami Beach, looking from the Atlantic Ocean west to Biscayne Bay, Florida–once a mangrove laden shoreline and fishery nursery. Mangrove - a type of tropical marine shore vegetation that often dominates estuaries and is characterized by evergreen trees of very distinct, that is separate, species thriving together, that can under optimal climatic conditions form a dense canopy forest that is a main contributor to a very high level of nutritional productivity feeding shrimp, crabs, clams, scallops and lobsters; and thus forms one basis of shoreline food chains in coastal tropical areas. Marsh - a type of temperate marine, estuarine and lake or river shoreline vegetation characterized by water tolerant grasses, reeds, algae and blue-green bacterium. Usually a nursery, or breeding, or feeding area for fish, birds and other wildlife. Mud flat - deposited fine grained material, usually found where sluggish current or no current at all allows silt (fine grained sediment) to settle to The bottom of a waterbed along a river, lake or particularly beside tidal streams. Productivity - the amount of biological material actually created by plants and bacteria based on available nutrients, sunlight, water and carbon dioxide. An index of the capacity of an area to sustain animal and fungal life, to hold the soil, transpire water and remodel conditions over time. Public Trust Doctrine - derived from Roman and English Common Law, a legal body of decisions holding that in certain designated natural areas, such as The bottom of rivers, lakes, streams and estuaries, land --that is or can be covered seasonally by water-- is of such great importance that its ownership is held by no one person and thus its use is restricted by law. Salt marsh - a type of vegetation characterized by salt water tolerant grasses, but unlike submerged sea grasses, they thrive along the dry shore and adjacent tide flooded landscape. 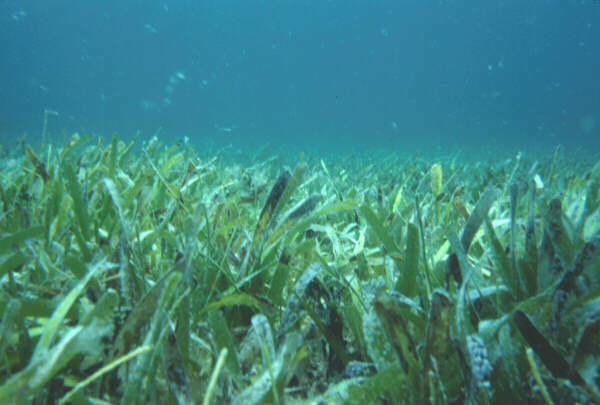 Sea grass - a type of flowering plant that grows in shallow marine or estuarine water where sunlight may penetrate to The bottom –or substrate– of the basin. These shoreline sea grass beds are nurseries for fish and shellfish. Spartina grass - a type of flowering plant that occupies the estuarine, or river marshes along shores with a temperate climate. Sound - an unusually constricted, or closed in body of marine water that floods into coastal areas. Sovereign lands - By application of English custom derived from Roman law, those areas of submerged land that belong to The King, Queen, Emperor, Empress, or some other plenary authority exercising absolute power over subjects in a designated territory. In The US practice these are property of the states and refer to property beneath any water body of significant size. Succession - The idea in ecology that vegetation and climate can over a very long period of time, several generations of plants and animals, alter any underlying conditions of soil (substrate), nutrients, and available sunlight enough to change a recognizable association of dominant plants and fungus. With these vegetational changes over time comes an alteration of the animals dependent on plants and soil nutrients for their sustenance. For instance sand deposited by wind is colonized by sea oats, or marram grass, railroad vine and verbena, only to be replaced, once the dune is stabilized by the grasses, by shrubs such as wax myrtle, willow or mallow and eventually pine trees take root in the sand that once was a bare dune. Sub littoral zone - that area below the water level at all times of the year. Basically submerged areas along a shore. Tide - Generally: daily changes in the surface elevation of the sea with respect to land lying along the shore. Actually a wave with a six hour period that encircles oceans around the world causing, as it moves, the sea to advance and retreat daily along a shore. Specifically: because the water moves, Odum referred to this diurnal action as the "pump" for tidal marshes that is one factor in many that account for the highly productive conditions in estuaries when compared to other wet or dry habitats. Tidelands - Generally refers to the area along a river affected by the daily fluctuation of ocean tides; specifically a name given to oil leases in state waters extending from below the tide line out over the continental shelf to the three or ten mile limit depending on the state in question. A controversy that arose after world war two over the federal and state control of oil drilling leases under the ocean, decided in favor of the several coastal states. Tidewater - that extensive land area of The Eastern United States form roughly Boston, Massachusetts to Brownsville, Texas, where affects of the sea with respect to the land lying along the shore of estuaries, bays, rivers and streams is so pronounced that small sailing vessels may ride the fluctuating flow of a tide in both an upstream or a downstream direction depending upon the flood or ebb of ocean waters. Wetland - officially designated vegetation or areas that have soil characterized by seasonal or periodic flooding, and that tolerate permanent or fluctuating water conditions over time (called a hydro period). Otherwise a kind of oxymoron that suggests nature is more complicated than our language is capable of cleverly expressing in sufficient detail. 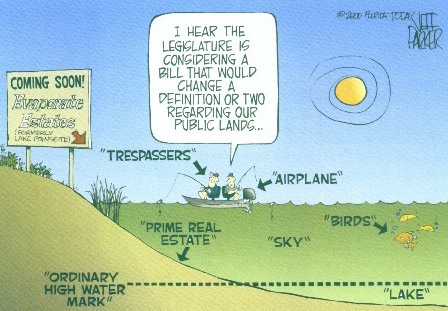 Zonation - The name given in ecology and natural history to a recognizable pattern of vegetation or associations according to specific features of a habitat or area with respect to elevation, substrate (soils), water, slope, or sun angle. A table, or handy guide to one zone along the shore as opposed to an adjacent zone determined by frequency of flooding.